Amazing venue, easy to access. The TO was helpful and responded quickly to every query. The concept of a tournament this size in the EU was ambitious and overall a benefit to the hobby/community. The marketing, collaboration and sales experience before the event, were both excellent and very professional. Lack of easily available food/water. London is a terrible city and terribly over costed. People with disabilities are not catered for. Rather than simply complain about the event the most helpful thing I can do is suggest solutions to the areas that need improving. A lot of the issues in planning the tournament came about due to the cost of renting space in London, which meant a lot of finances would have been diverted away from making the gaming experience more enjoyable. Move the LGT out of London to other cities in the UK (ie Manchester, Cardiff, Leeds etc). This would require a name change of course... EGT/BGT. Doing this would bring the costs down and potentially increase the size of the venue. London is an international city, not a British one, moving the event each year would be chance to showcase the 'Best of Britain' for the international community. Collaborate with hobby groups, brick and motor stores, and professional hobbyists outside of the GW corporate sphere. Hobbyists, such as Lukesapps, could provide help provide ideas and concepts for scratch-building decent massed terrain at a fraction of the cost. The stadium had only 1 food court, with a limited expensive and set menu. Contacting takeaways, and doing massed orders would have helped the customer experience. The Caledonian tournaments have a good system in which pizzas are ordered before the event. Support people with disabilities such as dyslexia, dyspraxia, autism etc. People should be given the option of declaring their disabilities, which in turn should be catered for. People with dyslexia shouldn't be penalized for making a mistake with their lists. People with dyspraxia should be given extra time to finish their games. People with a physical disability should be given their own table to avoid the need to move around. London is an amazing city. Although I do agree that there are many places which could host a large scale tournament. How about Scotland? Glasgow has so many excellent, affordable venues, a thriving game scene, easy to access. Most of what I have seen simply reads as an event that grew to fast to quick and didn't know how to handle it. Not working close enough with the venue leads to lack of people to do security checks. if you tell them 500 people with 2+ bags each will be at the door at opening time they know to send more then 1 bag checker. Same with food. everyone will want food in the break times (which are only 15 minutes) so its mad rush hour every 2.5h and then nothing. You can't handle that with 1 food stand. Everything was crammed on 1 floor round 1? Again lack of planning, The venue would have told you its not allowed for safety reasons and the TO could have spread it out from the start. Once stuff gets moved any resemblance of a floor plan you had is gone. As for terrain, your talking 180+ tables for the 40k GT alone. Your not going to get that much terrain from a few clubs offering you theirs. ^^^This. A thousand times this. The simple solution here is to vote with your wallet. I didn't go but from what I've just looked at it's not a tournament I would ever want to attend in the future. There are loads of tournaments of all sizes in the UK so it's not even as if you can argue we need to help demonstrably bad TOs (note in this case "bad" is being used to cover any manner of failings from gross incompetence, to being out of their depth, to whatever other reasons there were for the problems in London) in order to keep the scene going. I'd also say the problems at tournaments seem to increase massively the larger the attendance, which isn't that surprising. Maybe as a community we need to re-evaluate what can manageably be provided in the way of tournaments and stop aspiring to hosting massive events with more and more people. Size shouldn't be an indicator of quality in these events yet I note the LGT thread in the Tournament forum has that as one of the selling points. Perhaps not so wise considering what happened? I like the idea of moving it between cities. The Warmachine WTC changes countries every year and that works fine. It stops people from having their lives revolve around planning an event all year. As I said in the thread on the tournament discussion page it seems like a major problem was that the organisation of the...organisers wasn't great for something of this scale. From the start they should have had a small group whose sole job was terrain, then another whose job was venue stuff etc. London is a big city, I don't believe they would have been undermanned or lacked volunteers at any point. The thing is, will voting with your wallet actually achieve anything? This was a popular event in terms of numbers; if everyone who attended was so disappointed they didn't go next year, I'm almost certain other people will simply take their place instead. The organiser will learn nothing, as numbers will remain the same. I'm not so sure wherever a new city would help, but perhaps a new venue in London. We have the ExCel, Alexandra Palace, Earl's Court and the Olympia amongst others, all of which are far more suitable for this type of event. In terms of terrain, yes there were many, many tables, but there was also plenty of time to get things prepped. The fact that the bloke didn't start sorting out terrain until a week and a half before the event speaks volumes about the overall organisation. I think I'm being more vocal about this than other topics; this was my first tournament experience (although I didn't play), and the fact remains that they had a £40,000 or so budget to go off for this, there was no indication of this anywhere. I'm not accusing the guy of doing a runner with the money but you have to wonder how they've justified this. How empty were the tables? If expense/time was an issue why not just make 2D terrain with heights written on them as necessary? 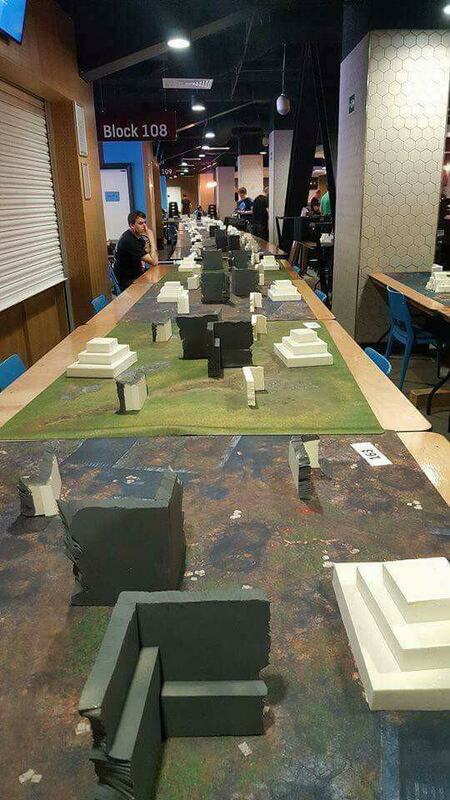 While it may not be aesthetically pleasing at least all the tables could have been covered with a proper amount of terrain. Just to be clear 2D could even be felt cut outs with writing on them saying what they were. The tables had a sufficient amount of terrain, it was the quality. With such a high budget they had settled on pieces of polystyrene foam haphazardly glued together, very wobbly and unstable. While the 2D terrain would be easier to create, it'd also create big LoS issues. Could you elaborate on these two? I'm especially curious on why the latter is bad. The FAQ had only been posted a few weeks prior to the deadline and a lot of people suffer from dyslexia. Making a mistake before the event itself shouldn't ruin your tournament score. Basic services (water/food) were overpriced. I'm sure the TO is just as upset with the result as the gamers were, but he's the only guy in the UK who could organize an event like this therefore we should really support him rather than hurl insults at him. Oh my that ‘terrain’ is shocking! Ah, ok. Did they penalize if you had it in on time, but had to change it because of rules issues? 1) What does the OP mean by "Too capitalistic?" 2) Haven't both LVO and AdeptiCon handled tournaments of 500+ people without having the issues listed by the OP? If so, why did the LGT have issues when they could have just copied what LVO and AdeptiCon did? 1. Making basic/essential commodities expensive (water food etc). I honestly don't know the cost of things like water or food are at Magic The Gathering tournaments, but they run usually 700 to 900 people. Granted, play area is much smaller for MTG, but it's the same concept. Star City Games holds tournaments in many large cities here in the US, and I haven't yet heard of any issues with food/water being too expensive. They always have plenty of staff, judges, etc. They always have plenty of room for the players. Granted, you may be sitting with two way overweight guys on either side of you with nearly no room to move at times, sure. But, that just comes with MTG. I'm aware that the UK is smaller than the US, and granted, they haven't yet tried to hold a tournament on say Manhattan Island in New York City. But, they don't seem to have a problem finding places (even in these very large cities) to accommodate 900 people. I guess that's what confuses me. With so many examples of ways to handle large tournaments (be it MTG or Warhammer), it shouldn't be too difficult to follow those examples. But, I can also say that I don't live in the UK, so I'm not sure how easy that would be. Those tables are an absolute disgrace IMHO. I don't care the size of the venue, number of players etc, you had to have known that for months. You start really early and you get help. Hopefully this will improve for the players next year. Except you don't have a clue how much work is done behind the scenes to run something like Adepticon or LVO and you don't see that unless your directly involved in the process. I'm sure that LGT could have talked to the organizers of LVO and/or AdeptiCon and gotten all the info they needed. It's not like these gaming conferences/tournaments are in competition with each other. They are at different times of the year. So, I have a feeling the organizers of LVO and AdeptiCon wouldn't have had any issues sharing info on how to handle a tournament that big. Yea the attempt at terrain was absolutely diabolical! Even just a cursory effort to disguise the fact is was foam would have helped. Most places in the UK a beer is £5 or less London £10 or more, it is basically the UK version of Manhattan. It has it's advantages but a lot of downsides. Having worked in London until last year I'm struggling to think of what those advantages would be for a gaming event? Just about anywhere else is easier to get to, and more pleasant to get to, and cheaper, and more spacious. Do you not have any friends that could of double checked your list before hand? I've been lucky enough to only have to visit with work, but I think half the problem with London is Londoners really. Our American partners usually find London easier to get to, but they have now I must admit tend to prefer visiting us in Edinburgh over London. But our European partners still find London easier to get to. Could that be because of Heathrow Airport? If I'm not mistaken, it's the busiest airport in the world making getting into London easier than anywhere else in the UK. If coming from outside the UK an industrial park nearer an airport would be a better venue. Agree a fair bit of the problem with out capital relate to its inhabitants. Probably more to do with having London City, Heathrow, Gatwick airports, though it doesn't make it less of an overpriced nightmare to spend any time in. I'm both dyspraxic and (currently) on crutches. I just realised reading this that is probably a massive contributor to why I didn't finish any games. I'm sorry but I can't agree with this sentiment. I recognize the problems that these people may have but where do you draw the line? If someone is morbidly obese do you give them more room or a bigger chair so that they are more comfortable? When you go to a competitive event then you are there to compete doing your best while your opponent does the same. The game should be level for both players. If one or both of the players have special needs then they should account for it when playing or, if they feel that they can't compete without some special help they should look for an event that caters to that problem.